« I must be nearing the end……………………..
Sale-a-bration is here at last. Everyone’s SU favourite time of the year. Customers – for every $100 spent you can choose a Sale-a-Bration product for FREE! 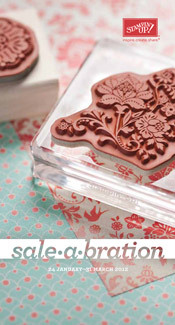 Hostesses – for workshop sales over $600 you can choose a Sale-a-Bration product for FREE! Do you have your free sale-a-abration phamplet? Just drop me an email at jacquicrouch@iprimus.com.au and I’ll post one right out to you. There are four fabulous stamp sets from which to choose AND BUT WAIT! THERE’S MORE……….a ribbon and brad bundle and also the most divine 12 x 12 DSP. This one you are really going to love! Call me now to book your free demonstration.